With Maya Angelou’s recent passing, we thought we would commemorate the amazing author, poet and role model by writing a bit about her life and works. Angelou was born in 1928 in Missouri, the child of working-class parents who divorced shortly after she was born. When Angelou was eight, she was sexually abused by her mother’s boyfriend. 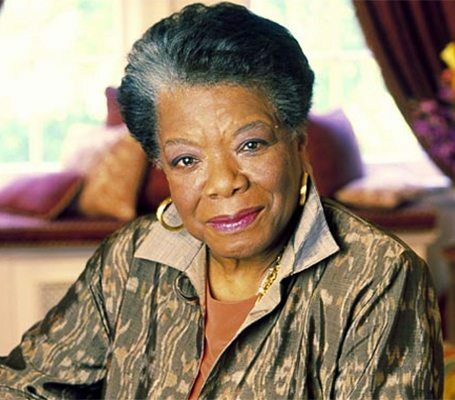 She told her family what had happened and this man was murdered, sending Angelou into a state of depression and disconnect from the world around her. She credits a teacher for helping her to reconnect herself to the world. She says that the teacher introduced her to famous literature and also many female black artists, which would help to shape her life and career. As a young woman, Angelou performed in several plays and become involved with the civil rights movement. Maya Angelou’s first book, an autobiography titled I Know Why the Caged Bird Sings, is her most well known title and chronicles the first few years of her life. 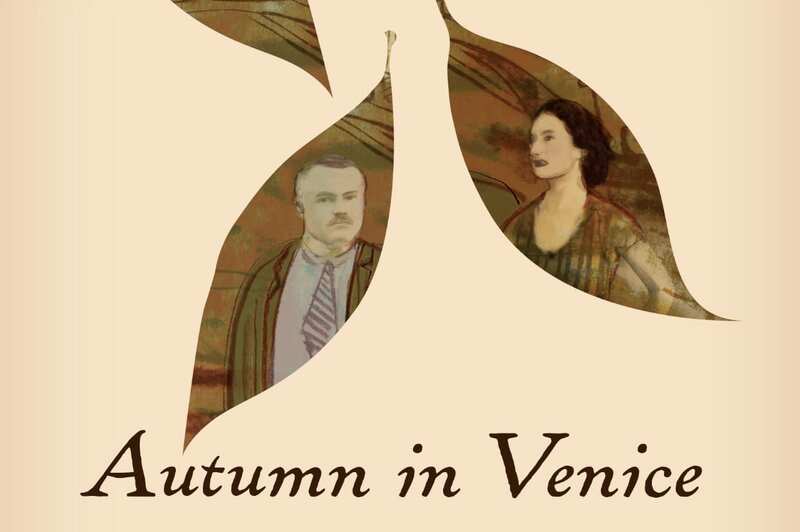 This book received critical acclaim and was on the New York Time’s Bestseller List for two years. 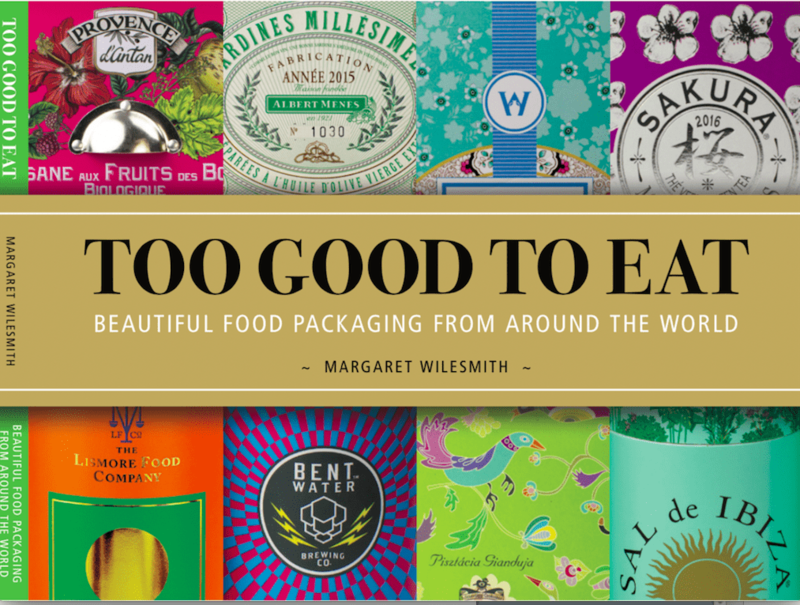 The amazing and inspirational book has been banned from several schools due to its graphic content. 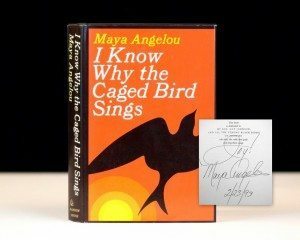 We have a first edition of I Know Why the Caged Bird Sings that is signed by Angelou. 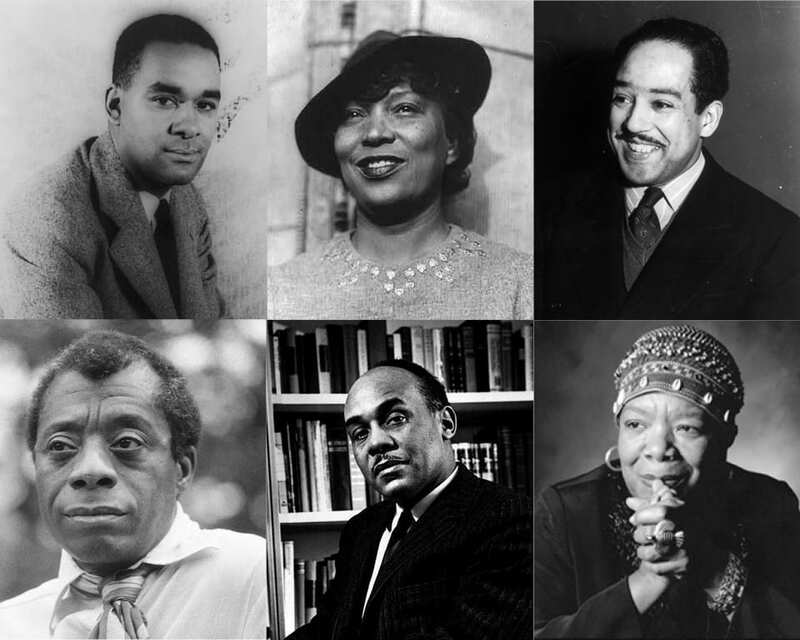 In her life, Angelou wrote a total of seven autobiographies, making her one of the first famous African American writers to write more than two volumes. Angelou, a greatly respected figure in society, was given several spectacular opportunities to recite her poetry at historical events. She read On the Pulse of Morning at the inauguration of Bill Clinton on January 20th, 1993. We have several first editions of On the Pulse of Morning. Angelou was also invited to read her poem A Brave and Startling Truth at the fiftieth anniversary of the founding of the United Nations. We have a first edition of A Brave and Startling Truth. Maya Angelou published her final book, her seventh autobiography titled Mom & Me & Mom in 2013, at the age of 85. This book details her relationship with her mother. 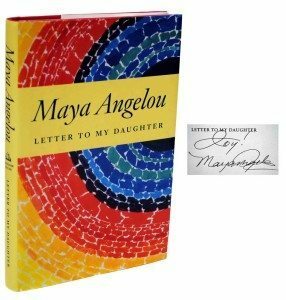 We have a first edition of Mom & Me & Mom that is signed by Maya Angelou. Angelou passed away on May 28, 2014, at her home in Winston-Salem North Carolina. She will be missed greatly by all who were privileged enough to be touched by her works of literature and inspirational way of living life. 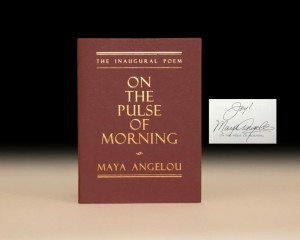 To view our entire selection of rare works by Maya Angelou, click here.